I never visit a client office without bring along a scanner, whether it be for demonstrating paperless systems, training users on document management processes or just scanning in my expense receipts in my hotel room at night. For several years, my trusted traveling companion has been Fujitsu's S1300 mobile scanner, and it has performed admirably even though it has taken some pretty bad beating. I estimate that the scanner (measuring 12" x 4" x 4" ) has been around the world 2 or 3 times now...and still pumps through 8 pages per minute even though the button cover is super glued on and the document feed tray sports a "duct tape" hinge. At a recent Legal Technology show, Fujitsu Scansnap product manager, Derek Flower, spied my intrepid traveling companion gracing the spotlight at the document management booth I was manning. He suggested that a better solution for me would be the new Scansnap S1100 and begged me to try it. So, a few weeks ago I took possession of my new traveling companion, and my immediate reaction when removing it from the box was "You have got to be kidding me!". Measuring 1" x1.5" x 11" and weighing less than a pint of beer, I was concerned that that there must be critical components missing and even double checking the box. I installed the ScanSnap Manager software that ships with the S1100 (really just an update, as I had been using the same software with my S1300), and plugged in the single USB cable between the scanner and my laptop (there is no separate power source), flipped open the little paper feed flap and was rewarded with the reassuring blue glow of the Scan button that this little guy was ready for business. 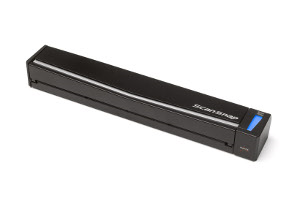 One thing to be aware of with any of the "ultra portable" scanners on the market is that they do not offer multi-page feeding - meaning that you have to scan each page of a multi-page document individually. The S1100 gets around this by giving you a few seconds between each scan to insert another page into the feeder - which it just adds to the current scan image. This works really well, as there are no buttons to push or options to click on your computer -you can just concentrate on loading your pages into the feeder. The ScanSnap Manager program is still industry leading in it's simplicity - allowing for multiple scanning profiles - I use one that crops my receipts into nice tight pdf images in gray scale so the accounting department can read them. I have another scan profile that loads anything I scan as an email attachment and another that will scan directly to my PDFDocs program for editing and redacting. A single mouse click prior to scanning loads your chosen profile. Of course, for those firms that use the Worldox document management system, the greatest feature of the ScanSnap manager is that it links directly to Worldox...you press the blue button on the S1100, your pages scan, and the next screen you see is the Worldox profiling window. It is just that slick! It also ships with FineReader, so you can convert your scanned images into editable MSWord documents while on the road. Another feature that I was amazed at was the ability to scan credit cards and driver licenses, thanks to the straight feed option that can be used when scanning. My new sidekick has settled nicely into life on the road! Do you know your software key code? Why Do You Tolerate Your Slow PC? Worldox GX2 - Coming Soon!